When insulating your attic, spray foam insulation is one of the easiest options to get the job done. This insulation is made out of polyurethane and a foaming agent. Polyurethane is no new insulating material. For years, it has been used in refrigerators and water heaters as an insulating material. There are two types of spray foam available, namely open cell (isocyanurate) 0.05 lb./cu. ft. and closed cell (polyurethane) 2.0 lb./cu. ft foam. 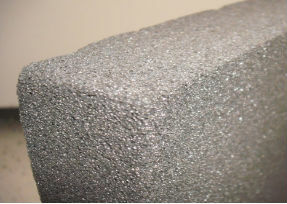 Closed cell foams have higher R-values and are therefore better insulating agents. An R-value is the measure of insulating capabilities of a certain material. A higher R-value results in greater insulation. In open cell foam, tiny cells of the foam are not completely closed. Air fills the space that is within the material making it softer and weaker than closed cell foam. Closed cell foam has a gas that fills the closed cell. This helps the foam to rise adding to the insulating capability of the foam. Liquid polyurethane is pumped at high pressure onto the walls of the attic. This substance expands on coming in contact with the wall, forming an even insulation layer. The advantage of using spray foam insulation is its ability to fill up small gaps and cracks, which other traditional forms of insulation such as cellulose or fiberglass cannot do. Spray foam insulation makes it possible to not only fill in wall cavities but also to perform air sealing in the same step. This insulation does not shrink, settle, sag, or biodegrade. It helps in controlling moisture condensation and is usually resistant to fire and insects. Another added advantage is that this type of insulation does not require any kind of fasteners to hold it in place. Spray foam insulation also manages to save on costs incurred in air filtration. Air filtration is a costly and energy wasting process. Spray insulation has a high R-value per inch. This means that the material manages to act as a better insulator, preventing the loss of heat. Walls can be built with 2 X 4 studs instead of the 2 X 6 studs that require traditional insulation. This is an important factor when it comes to designing your house, as it increases the floor area. In a 1500 square foot home, it can lead to an increase of 35 square feet. Ideally, an attic would require an R-value of 38 to 44. Sidewalls will need to be insulated with an R-value of 11 to 18. The high R-value of this foam ensures that installed heating and cooling equipment works efficiently, using less fuel while maintaining a uniform temperature overall. Today, there are eco-friendly spray foam-based insulators such as bio-based insulation. This is a soy-based insulation spray foam. The advantage of using this bio-based insulation is that it creates a barrier that blocks irritants such as pollen and mould that may cause various allergies. The insulating layer also helps in preventing noise pollution from entering the house. Bio-based insulation foam is environment friendly because it substitutes petroleum ingredients with soybean oil. This reduces the dependency on fossil fuels.